Welcome to Mediterra Art Hotel. 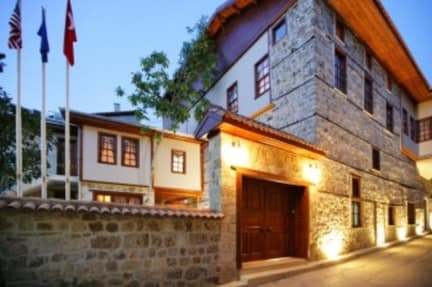 Our hotel is unique and based on an an Ottoman-style and is located in the historical town of Kaleici. We offer free wireless and an outdoor pool. Each room also has air-conditioning and a flat-screen LCD TV. The spacious rooms of Mediterra Art Hotel are elegantly furnished and feature traditional Turkish architecture. All rooms come with a minibar and slippers. Guests can benefit from Hotel Mediterra Arts car rental service. The hotels tour desk can provide information of the local area. Mediterra Hotels al fresco restaurant serves international and local cuisine. Drinks and refreshments are offered at the hotels bar. Hadrians Gate is a 5-minute walk from the hotel. Antalya Airport is 12 km away. Cash or Credit cards accepted (Visa and MasterCard) for payment of balance.